San Francisco, CA - June 4th , 2014 - Fiilex, a leader in LED lighting for the broadcast, film and photo industries, announces the Color Blender accessory for the P200 Flex Jet. The Color Blender allows for an even front projection of colored light from the P200. This adds the qualities of a traditional studio light to the unique color emitting properties of the light. The accessory attaches to the front of the P200 via a bayonet mount, and has a slot to attach the included barn doors. The P200 can now throw colored light wherever you need it, making it a powerful tool for creativity. "Image makers are always trying to add visual interest to their scenes. Adding color is a great way to liven up your shot," says Brent Siebenaler, Brand Manager for Fiilex, "The Color Blender is an elegant solution for projecting color into your scene, and saves you the hassle of working with gels and clothespins." 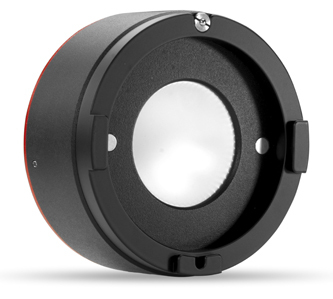 The Color Blender features Fiilex's magnetic accessory mount system, making it compatible with the Dome Diffusion, Fresnel Lens, and other accessories. It is also compatible with the P2Q Converter Kit that increases the beam intensity by 8x. The Color Blender is available June 25th from dealers throughout the US, Canada, and Europe. The US retail price is $199.00. For a complete list of dealers and accessories please go to www.fiilex.com.